The Elektron Octatrack MKII builds on the success of the original Octatrack, with a range of improvements and enhancements to better your workflow and creativity. The Octatrack MKII is an 8-track audio sampler featuring 8 dedicated MIDI tracks and instant stereo sampling capabilities. The Elektron Octatrack MKII now includes a crisp OLED screen, providing feedback information, even in dimly lit environments. Another new feature is the contactless, smooth performance crossfader and precise, high-resolution encoders. The number of dedicated buttons has been increased, designed to improve your workflow. The back-lit buttons are ultra-durable, rated for up to 50 million presses for optimal longevity. With its portable design and vast improvements, the Octatrack MKII is ideal for stage performers and studio use alike. 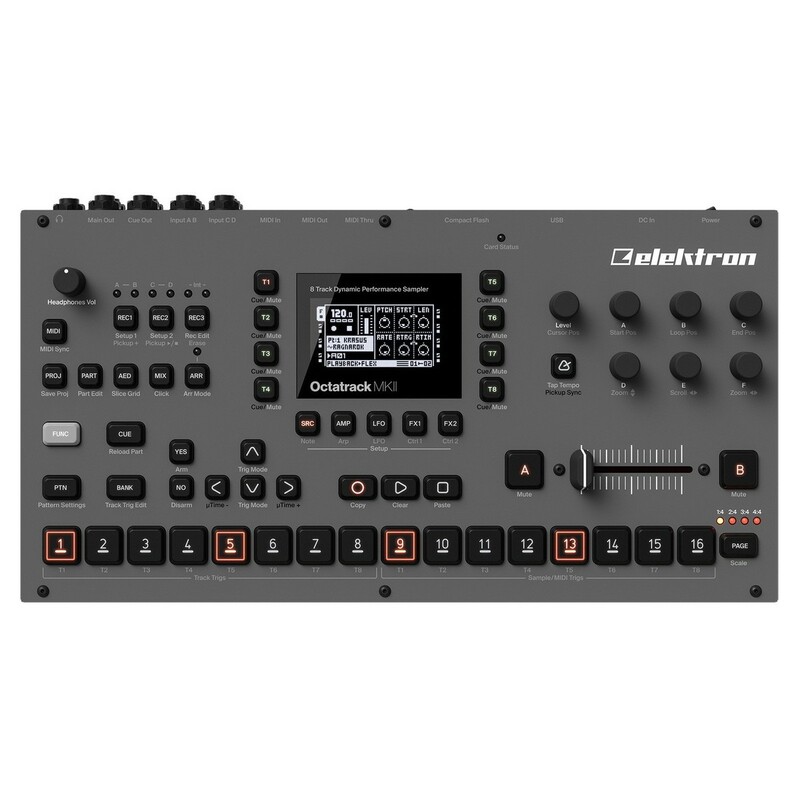 The Elektron Octatrack MKII is the second and improved version of the renowned Octatrack performance sampler. This high-quality stereo sampler includes everything you need to make your live performance memorable. It includes 8 stereo audio tracks and 8 dedicated MIDI tracks, allowing you to create complex patterns, tracks and even songs. The ultra-durable back-lit buttons are rated for 50 million presses, making them some of the most durable pads available on the market. One of the most prominent new additions, to the design is the crisp OLED screen providing optimal feedback, even in dimly lit environments. The high-resolution encoders provide precise control for all your levels, with an increased amount of dedicated buttons designed to improve your workflow. The premium-grade components and versatile design of the Octatrack MKII, make it ideal as a performance sampler as well as being useful in the studio. The sampler allows you to instantly record samples in real-time. It also allows you to utilise time-stretching and pitch-shifting for optimal flexibility when it comes to processing your samples. The internal sample processing ability redefines how you transform your sounds, giving you in-depth control at every step. Acting as a successor, to the original Octatrack, the MKII includes a contactless silky smooth performance crossfader, allowing you to switch and blend between A and B modes for added versatility. Additionally, the MKII is fully backwards-compatible with Octatrack MKI projects and data. As well as providing a wide range of processing and editing tools, the Octatrack MKII includes 3 LFOs per track and 2 insert FX per audio track. This allows you to get the most out of your sequences, giving you the ability to transform your sounds in ways you never thought possible. The integrated sequencer is live-friendly allowing you to make changes on the fly with ease. As well as being able to insert FX into your audio tracks, you can use the sequencer to control both internal sound and external MIDI gear. It can be also used to route signal, acting as a portable mixing desk for your whole setup. The lightweight, compact and highly portable design makes the Octatrack MKII one of the most live-friendly samplers available on the market. The internal hardware, premium-grade components and compact design means you can put it within your backpack with ease, take it with you anywhere you go so you can collaborate with friends and other artists. 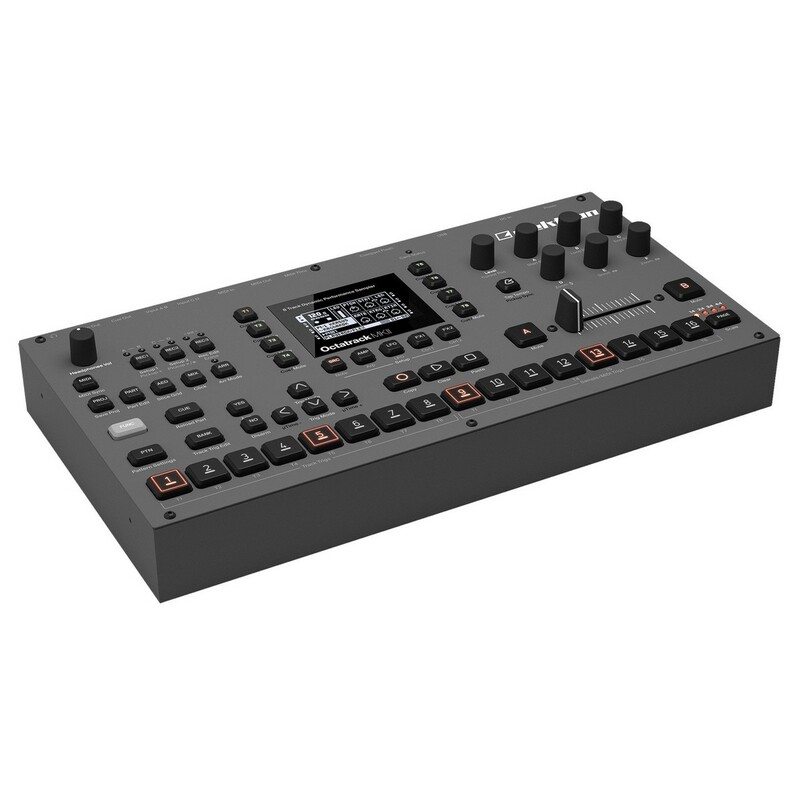 The Octatrack MKII also includes a wide range of connectivity including: USB, MIDI Thru, Out & In and more. There are also balanced audio inputs with plenty of headroom should you wish to sample your voice or an instrument. A headphone output is also included for private monitoring as well as 2 impedance balanced main outputs and 2 cue outputs.